Heathrow has been conducting a somewhat minimalistic 6-week consultation on its plan for a new runway to the north west. The questions in the consultation (only really 2 questions, with scope for further comments) are only on factors to take in to account, and whether more people should be affected by a slightly smaller amount of aircraft niose, if fewer people should be subjected to a larger amount (dispersal or concentration). The consultation is not whether those consulted want a new runway. The public consultation sessions are now ended. The consultation did not mention the Heathrow Hub proposal for an extension of the northern runway. 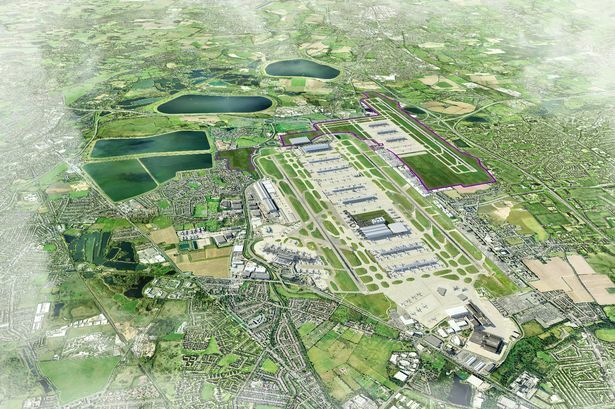 A Heathrow spokesman said: “We will take your opinions into account as we look to refine our north-west runway proposal…” Those opposed to the plans have been critical of the consultation, saying it has been neither honest nor transparent. Heathrow has been disingenuous in making no effort to show where the landing flight paths would go, making informed comment impossible. Either way there will be more aircraft noise for many thousands of homes. Claims that the airport will have 20 – 30% more flights and be “quieter” (properly defined) are manifestly not logical. Hundreds of people from across the borough have shared their views on the north-west runway proposal at consultation events run by Heathrow. Residents piled into two exhibition days, held at the Holiday Inn, in Brentford, and the Civic Centre, in Hounslow, last week. The sessions were set up to provide people with the chance to learn more about the proposal, voice their concerns and meet members of the Heathrow team. The days were part of a six-week consultation by the airport in light of the shortlisting of a new runway or a longer existing runway by the Davies Commission, which is investigating airport expansion in the south-east of England. Nigel Milton, director of policy and public relations said: “I would like to say a big thank you to all those in the area that have taken part in Heathrow’s local consultation in the past few weeks. “Whether you have shared your views online or attended one of the consultation events which have taken place around the airport, we are really grateful to you for taking the time to do this. “We will take your opinions into account as we look to refine our north-west runway proposal for the consideration of the Airports Commission in May. However the consultation has been met with some disapproval, particularly from councillor for Brentford, Ruth Cadbury, who said ‘this so-called consultation is neither honest nor transparent’. She said: “Heathrow Airport is consulting not on whether residents want a third runway, but which of two sites north of the current airport should be chosen. “Furthermore, they are not prepared to show where the landing paths would go. “Both would mean extra noise for many thousands of homes. “By my calculations the landing path would be centred over the heart of Heston, the Sky TV studios, Brentford Station, Griffin Park, Kew Bridge, the Russian Orthodox Church and the Hogarth estate. Heathrow has now hosted all 14 of its consultation events in local areas across west London. People who did not get a chance to attend an event can still have their say on the issues most important to them through the online consultations, which will remain open until this Sunday. Information from the public consultation will then be collated and the north-west runway proposal refined accordingly. It will then be resubmitted in May. (12 short pages including many maps and diagrams). People can respond online, or they can ring a number to have a phone interview. Those who receive the booklets through the door can respond on the Freepost form, or they can attend one of the public exhibitions that are planned. What factors do you think are the most important when planning a new runway? All the factors listed below are important to local residents to varying degrees. Your response to this question helps us understand your priorities. Which of the following statements best matches your attitude to noise relief from aircraft and the number of communities living beneath flight paths? – Providing periods of significant noise relief for all communities is more important than limiting the number of communities living beneath flight paths. – Limiting the number of communities living beneath flight paths is more important than providing periods of significant noise relief for all communities. How can we improve our proposal for a new runway? Please use the space below to tell us your ideas or to mention any other factors not covered by Questions 1 and 2. Map above (from AirportWatch, not from Heathrow) indicates the likely approach route (orange line) for the North West runway, from the east (on westerlies) The runway might be 200 metres further south, if they try and save Harmondsworth Tithe Barn (see map of that option). Posted: Saturday, March 15th, 2014. Filed in General News, News about Airports, Recent News.